My husband’s birthday was the other weekend and after making him waffles for breakfast on Sat, his favorite muffins (cinnamon bun muffins) on Sunday, chocolate chip cookies for a dessert, (it was a paleo treat weekend galore! ), and a great dinner on Sat, I thought we’d go with a lighter, and quicker treat (thanks for the ideal from primallyinspired.com) for his actual birthday dinner and he loved it! He tried to not share with Tate, but that just wasn’t possible. I would have posted a picture of him eating this, but he absolutely refused to be in a picture with him eating a chocolate covered banana. Fair enough. 1. In a small bowl, mix together your almond butter, vanilla, and cinnamon together. Then, peel and cut bananas in half. Be sure to slice them vertically. 2. 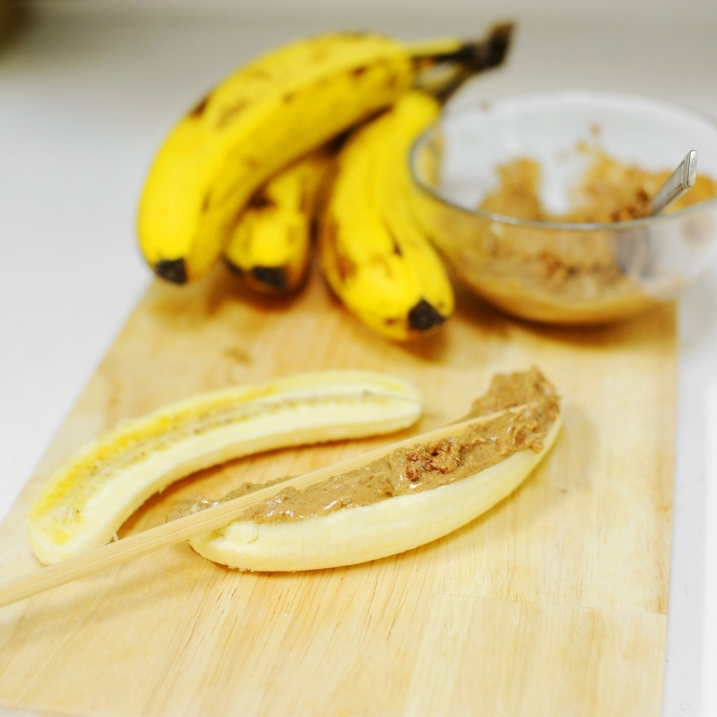 Spread the almond butter mixture over half of the two banana slices, press your chop stick, popsicle stick or kabob skewer. Put the other half of the banana back on top and then put them in the freezer until firm. 3. 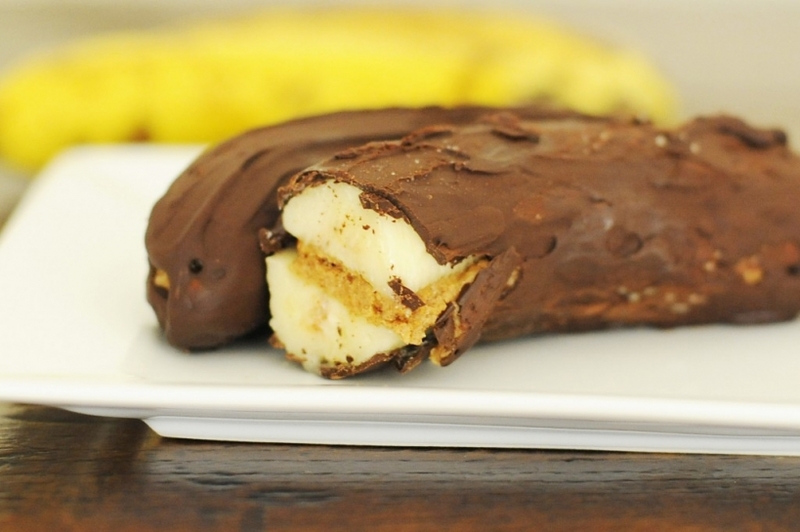 When your banana pops are all the way frozen, melt your dark chocolate and coconut oil over low heat. Stir until melted and smooth. 4. Lastly. dip each banana pop (or just get messy with it and smear it with your hands) in the dark chocolate and place on parchment paper. Place back in the freezer for a few minutes until chocolate is hardened and cold. Enjoy! 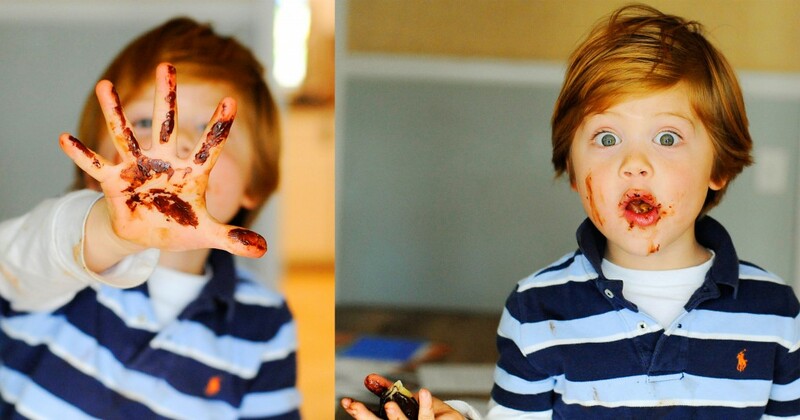 He’s so amazingly messy…and goofy! Jen Meier - Hi, love your site. I am finding that a lot of Paleo recipes (especially the sweets and treats) do not have nutritional information. Are you aware of a site that shows nutritional information? I have been hand calculating numbers for my yummy desserts and it is a pain! Grr.. I am trying your pudding recipe tomorrow…yay!